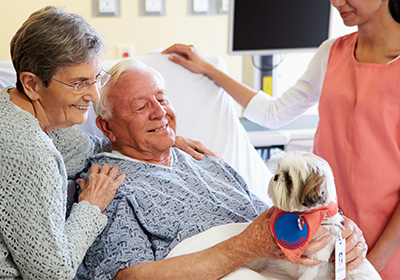 There is little doubt that animals can have a positive effect on patients’ psychological well-being. 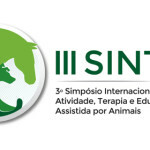 Many doctors of human medicine are also convinced of this, which is not only say that they fully support animal assisted interventions (AAI), but they also prescribe this type of intervention to their patients. The first nationwide survey on AAI has confirmed a trend that had already been perceived in recent years by the doctors who know about AAI and recognise the beneficial effects. A nationwide survey was carried out by the National Reference Centre for animal assisted interventions in partnership with FNOMCeO and investigated the knowledge, opinions and professional experiences of the doctors regarding AAI. 670 doctors responded. The survey took place between March 2 and April 30, 2015, and was promoted by the National Reference Centre for animal assisted interventions (CRN IAA) of the Institute Zooprofilattico delle Venezie, thanks to the collaboration of the National Federation of the Orders of Physicians and Dentists (Federazione Nazionale degli Ordini dei Medici Chirurghi e degli Odontoiatri -FNOMCeO), which was responsible for the distribution and collection of the questionnaire to the registered doctors in Italy. The main objective of the survey was to understand the current situation regarding the knowledge, attitudes and professional experiences of doctors towards AAI: Who are the doctors who are interested in the AAI? What do they think about it? How much do they know about it? 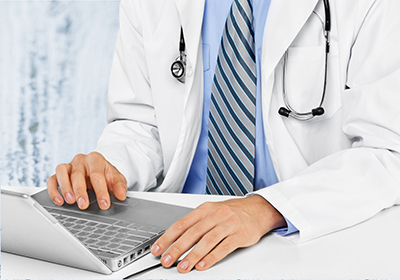 What are the benefits they think it can bring to patients? And what are the risks? The questionnaire was sent by email to 106 provincial branches of the Order. Data was collected through the CAWI (Computer Assisted Web Interviewing) method. 670 doctors took part and of these 508 said they were aware of the existence of animal assisted interventions. 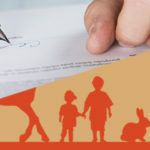 The typical respondent was a woman, over 55 years old, resides in the northwest of the country, possesses an animal, has been in the medical profession for more than 30 years and is a doctor who specializes in internal medicine. The most since striking result is that most of the doctors who know about AAI are also fully supportive of this type of intervention (93.7 %) and do not consider it risky and stated interest in learning more about the subject. 93.7% of doctors who knew about AAI said they were fully supportive of this type of work, and more than 1/4 know about centres that use AAI or had patients undergoing this type of intervention. about 1/4 know about centres that use AAI or have had patients undergoing this type of surgery. 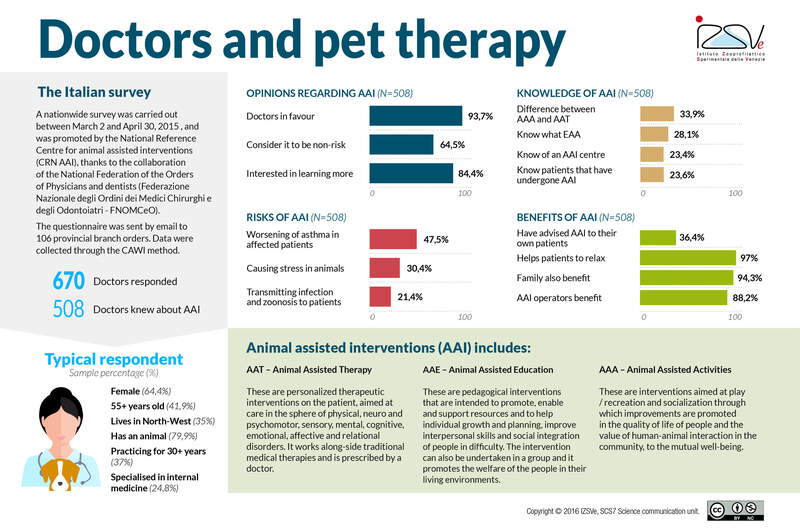 Also, the prescription of AAI by doctors is becoming more widespread: 36.4 % of the doctors who know about AAI have recommended pet therapy to their patients, and of these 57.2 % reported positive effects due to these interventions. For example, animals help patients to relax, and not only patients but also their families and those who work in such centres derive benefits from such interventions. 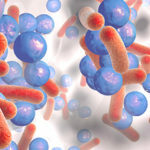 The most frequently identified risks were that animals can worsen asthma in patients so affected, that interventions can cause stress in the animals themselves or that animals can transmit infections and zoonosis to the patient . 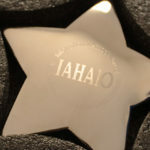 The results of the survey were presented at the 14th International Conference of IAHAIO (International Association of Human-Animal Interaction Organizations), which took place at Paris between 11th and 13th July 2016.